D-Log: Thought of the Day! I'm in Spring break--finally! This past quarter seemed to stretch and stretch and stretch. Like Moody, I'm so proud of myself; I got the grades for two classes and still waiting for the third. Lately, I haven't been keeping up with the blog and the same trend will continue next quarter too with me taking four classes and one group studies. There's so much to do around the house and we have to get to some of it during the break. Sol and I committed to cleaning closets... It seems like I'm always cleaning closets; in reality I'm always only talking about cleaning closets. There's also the yard with some prep work for the Spring. The tulips have already come up and got snow over them a couple of times, but they're still doing fine--I hope they survive. Tala has a habit of making things disappear. For example, her Cinderella doll disappeared for months and months; we looked every where but couldn't find it. Every time we're at a toy store, she'd want one, but we remind her of the no-replacement policy for lost toys. Few weeks ago she told me it's under her bed, and sure it was. I struggled with moving the trundle, the rug, and keeping her and Moody out of the way, till we were able to "rescue" Cinderella. 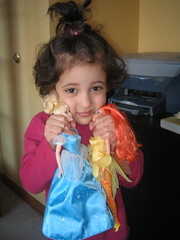 Coincidentally, she found the Barbie Fairytopia doll, that was missing for quite some time, on the same day. 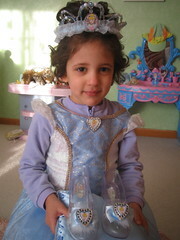 In the house, Tala is always in her Cinderella dress... and I'm always "Stepmother!" One time I said to her "I love you, Cinderella." She replied, "you're my Stepmother, you should be mean!" For weeks, she had been wearing the dress with one slipper, because the other one went missing. She'd be walking around the house limping with the awkward sound of one slipper clicking on the floor. It fit the story perfectly to have one slipper and we were waiting for Prince to knock on our door one day with the missing slipper. Yesterday, she came running, yelling with excitement, "I found my slipper!" Bummer, I guess we can't expect a prince to show on our door with a slipper anymore. Now to the thought of the day. Yesterday, Moody was doing well eating his dinner, while Tala was only eating salad and nibbling on baked potato. Sol pointed to her that Moody is growing because he's eating his dinner, and she's not. She faked some sobbing and said "I'm not going to grow. I will not see my parents dead. I will not see my Mom when she's buried." Such blessing to have a daughter who knows her priorities in life. Tulips already? Lucky you! It is closet cleaning season for us, too. We have so much junk, we think that all we have IS junk! Nikki, Nick and I are pack rats, but I'm slowly trying to change my attitude. Hey, stepmother, at least Tala never called you what she called me: Grandmother! One has to have the wild imagination of a child to call a scratchy old man, grandmother. I guess role-playing takes a big part at this stage. For the longest time, Nick believed we were a family of bears and sometimes, we were dogs. He preferred playing on all four, lick our cheeks, like puppies do while making all the slurpy sound effects that went with that! The tulips didn't bloom yet, but they are up the ground aleady. lol, I forgot about the grandmother thing! Well, shes diplomatic, she didn't call Nikki that. I'm glad licking cheeks isn't part of role-playing here!